Sometimes I sit in my kitchen, or on my sofa in the living room, I close my eyes and imagine food. Just food. I can see colourful ingredients, vegetables, seafood, spices and herbs, or beautiful dishes carefully prepared on plates. I don’t have to do anything, these pictures appear naturally in front of my inner eye. It’s a helpful gift and the reason I never fear running out of inspiration, as long as I take my time to sit down with a cup of tea, relax and let go my kitchen ideas will come to me. 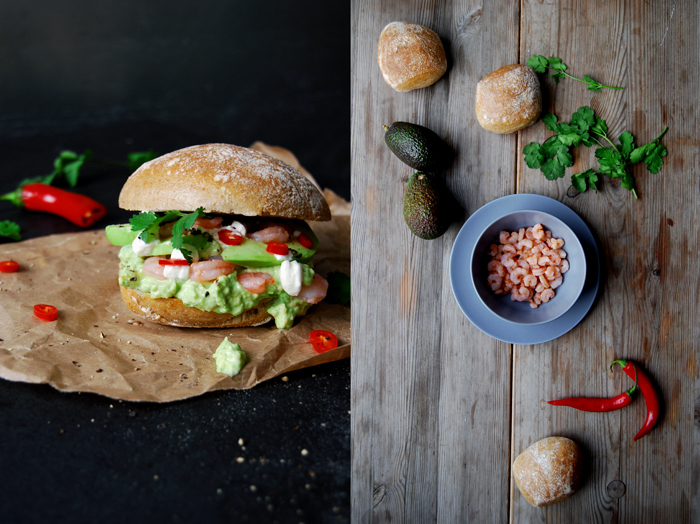 Culinary daydreams are fun and I particularly enjoy the ones about new sandwich creations. It makes me feel like a child in a toy shop. I can pull any ingredient out of the imaginary shelf, mix wildly and create whatever comes to mind on the plates, or I can keep it simple and work (or dream) minimal. Fruit and ripe cheese is always a great match, but there’s so much more, sweet and salty, creamy and crunchy, sour and spicy, fresh and aged aromas, there are endless possibilities. It’s an exciting process as I never know how it will taste until I finished taking the last picture and enjoy the first bite. Some recipes are hard to imagine but I always follow my gut feeling (literally) and that’s quite reliable. 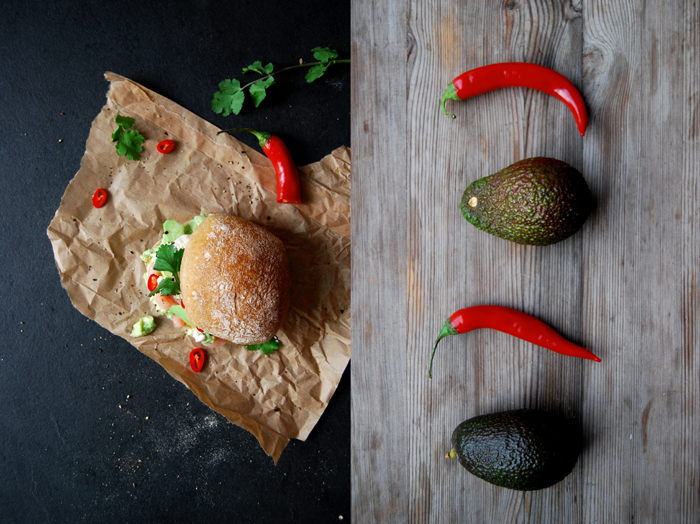 Today I felt like cumin guacamole, it’s a great fusion of this distinctive spice and the wonderful velvety fruit, they truly bring out the best in each other! 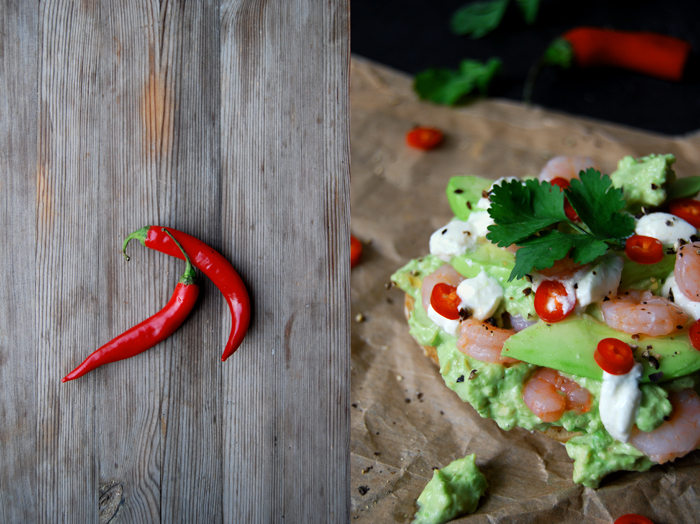 I merged this duo with the salty taste of the sea, fresh herbs and some hot spiciness. 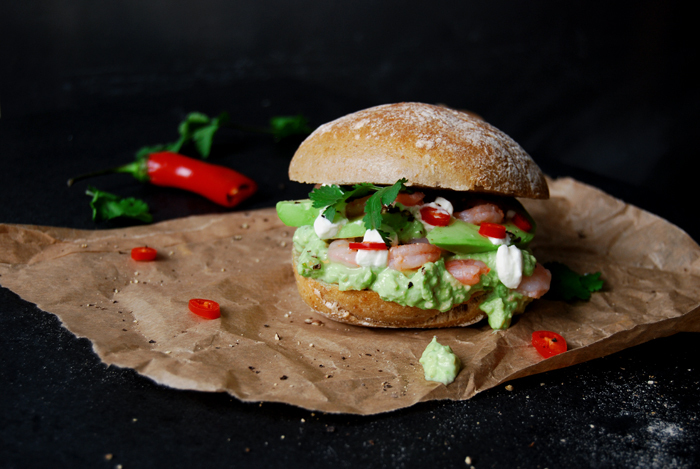 Shrimp, avocado, coriander and red chili peppers stuffed between a bun, my daydreaming was right, it was delicious! A special event calls for action, I’m asking for your help! The wonderful Saveur Magazine opened the nominations for their Food Blog Award 2015 and it would be great if you could support eat in my kitchen. You just have to hop over to Saveur.com, choose the categories that you feel my blog fits best and fill in www.eatinmykitchen.meikepeters.com, here is the link for the nomination! Cut 1 avocado into slices, chop the second one with a fork and mix with 2 tablespoons of the sour cream. Season with lemon juice, cumin, salt and pepper to taste. 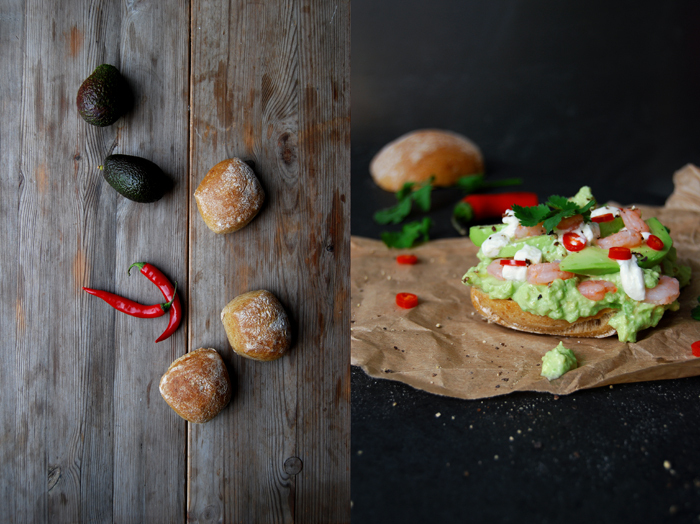 Divide the guacamole between the 2 buns and spread it voluptuously on the bottom half. 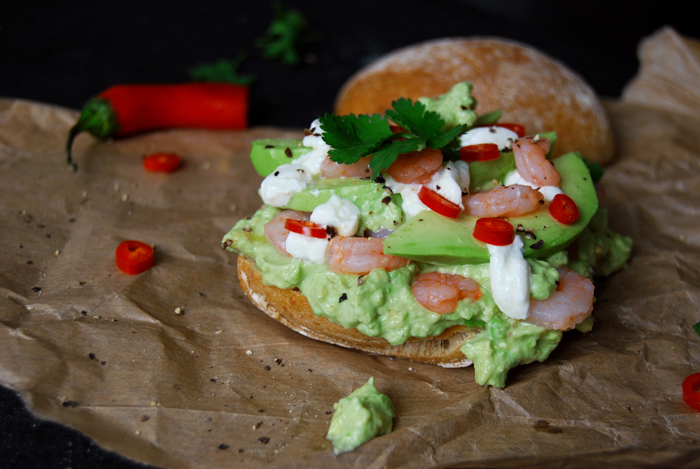 Lay the shrimp and avocado slices on top and sprinkle with the remaining sour cream, the chili pepper, crushed pepper and coriander leaves. Enjoy! OMG this looks amazing! I love cumin so I’m definitely going to have to make this guac! Pinning now!